The Changshu Municipal People’s Court in Jiangsu Province today sentenced citizen activist, Gu Yimin (顾义民), to 18 months’ imprisonment for “inciting subversion of state power.” In addition, Gu will be subjected to two years of post-release deprivation of political rights. 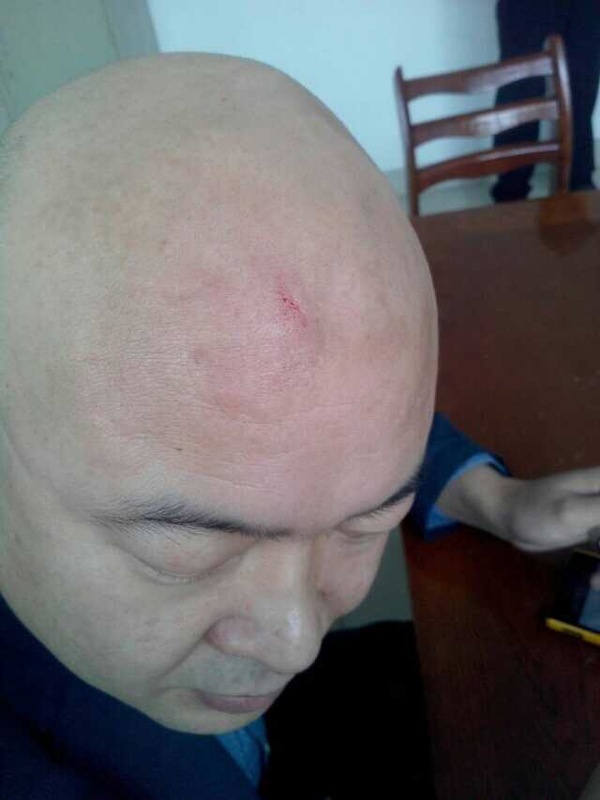 Head injury of He Huixin, one of Gu Yimin’s lawyers, from beating by unidentified man outside Changshu Municipal People’s Court, March 24, 2014. Gu, 37, was arrested and charged in 2013 after he filed a request to march to mark the anniversary of the June Fourth crackdown on the 1989 Democracy Movement, and posted June Fourth-related photos online. According to Liu Weiguo (刘卫国), one of Gu’s lawyers, the judge did not allow Gu Yimin to speak in court, which made him very angry. Liu said that Gu is planning to appeal. Liu also told HRIC that after the trial, outside the courthouse, when he and co-counsel He Huixin (何辉新) tried to stop several unidentified persons from taking away a Shanghai netizen who came to support Gu, they both were beaten up by those individuals. Liu added that many police officers were present and witnessed the beating but did nothing to intervene. He Huixin sustained a head injury and was treated at a hospital; Liu himself did not suffer any major injury.